Our Driveway Gate Openers service company can install and repair your gate opener. We are the best Driveway Gate Openers Company in Lakeside. Our local company has been open for many years and our skilled contractors are very knowledgeable when it comes to installing and repairing openers. Our contractors will supply and install a new opener. We offer free estimates and are available 24/7 emergency services which basically means call us when you need service night or day. Our gate contractors can dotroubleshooting service to find out what the repair might be. Our Driveway Gate Opener Company services electric and automatic gates. We also repair and install the following types of gates- pedestrian, walk through, driveway, parking garage and custom made gates. We have master technicians for the installation of gate safety and exit loops. They are both vital for the automatic movement of the gate once the car drives over the loops. With exit loops, the gate opens automatically and thanks to safety loops, the gate won't close on a car. Our premier company is an expert in exit & safety loops installation and every technician of our business is well-equipped. We burry the loops at the perfect distance away from the gate and also in the right depth! As specialists in all accessories of residential gate openers, assure clients that we know how to connect the wires and make the right settings so loop sensors will detect the presence of the car. We guarantee excellence as far as our work is concerned and full dedication by courteous staff. Our local driveway gate opener’s service takes care of installing and replacing gate openers. Our gate contractors can repair broken hinges, gate and posts. Our welding service welds grills, window bars, wrought iron gates and security bars. Our installation contractors are quick when it comes to installing gate openers. We repair and install several name brand products such as Elite-Door King- GTO PRO- Eagle- Ramset- FAAC- All o Matic- Multi-code- Linear- Reno-Viking. We want the very best for our customers. That is why we are the best driveway gate openers company in Lakeside. 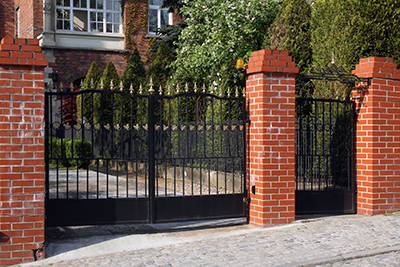 There are several different types of gates that we install and repair. One type of gate is the slide gate in which a chain passes through the opener and runs near the bottom of the gate and the chain moves back and forth sliding the gate open and closed. Theswing gate, which swings open, has three different types of openers such as- the ram arm which is attached to the gate post and is used with a hydraulic or jack-screw piston. The next is an underground opener, which is located on the hinge and gate via a link arm. And the last is a swing arm opener is a box that sits to the side and an arm extends to the gate that will open and close the gate. Contact us today for fast and efficient service that is affordable. A gate opener remote sensor photo eye is a feature that all gates must have. This safety device can detect if is between the gate and the post. If is detected the gate will open back up preventing a tragic accident. Your gate opener needs to be installed by aprofessional gate opener installer. The opener must be installed correctly to prevent damage to a family member, pet or property. Our installation contractors can also install a phone entry systems intercom. This device will keep unwanted guests from entering your property. Driveway Gate Openers in Lakeside is available when you need us the most. We have affordable prices and give free estimates on our products and service. Our driveway gate opener’s contractor can install and repair your gate opener the same day. If you are looking for a custom gate we can install that as well. We repair and install gates in various sizes and styles. We also repair and install gate openers and other parts of your gate. We are the best Driveway Gate Openers Company in Lakeside.